Kirstyn Koswin is the Research Officer for the Reach Project. In addition to serving as a principal researcher, Kirstyn coordinates teams of student researchers as they conduct primary and secondary research on the provision of social services to those who are hardest to reach. She has led research teams in India, Jordan, and Rwanda. 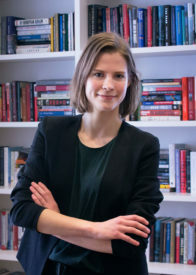 She holds a Master of Global Affairs from the Munk School of Global Affairs and Public Policy and a Bachelor of Arts (Honours) from McGill University. Between her undergraduate studies and her graduate studies, she worked in business development and project management for a consulting firm in the energy sector. Kirstyn is particularly interested in the provision of services to populations affected by conflict and fragility.